2014 is well underway and my inbox is filled with your happy news. I usually like to get this post out within the first week of January, but as you can see, I am paying dearly for the unexpected break I took. Whoopsie. I promise, I'll get back to you soon. Bear with me. You little darlings have been badgering sweetly asking me to repost a 'You Asked For It' post I did at the beginning of 2012. Ask and you shall receive! I've posted my quick and easy tips for making sense of the wedding planning labyrinth. This week, I'll answer more of your questions in roundup form! Congratulations, dolls, on your engagements! I’m engaged! It happened on New Year’s Eve, it wasn’t cheesy and I am so super happy I can’t stand it. So…what do we do now? Is there something I should be doing?-I feel like there’s something I should be doing. I could just pee-Help us! No need to pee. I promise. It does terrible things to rugs. First of all, calm it on down, sugar! You got engaged, what, like ten minutes ago? You should be enjoying this, basking in the delicious glow that is being engaged. Now, don’t get me wrong, I am not a fan of “should’s” and “must’s” when it comes to weddings, but I think there are a few things worth doing in the very early stages of wedding planning. 1. Celebrate, celebrate, celebrate! Throw a party, take a vacation, or shout it from the mountaintops, if you want. Just get out there with your sweetie and make a joyous ruckus! My favorite part about being engaged (besides the obvi) was getting to prance about; all dewy and doe-eyed; talking about my man and our super awesome lurve. Having that extra special, one on one time made the daunting task of planning our wedding much less overwhelming. 2. Set a date. If you ask 100 couples when it’s best to get married, I guarantee you’ll get 100 different answers. So, I’m not going to try to sway you one way or the other (for now, winky face). I will say that the two of you should talk it through a little bit, see what works best for you. I wouldn’t worry too terribly much about everyone else, because no matter what you do, people will have opinions (ask me about having a Friday wedding!). 3. Set a budget. Seriously. Before you look at flowers or venues or any of the 150 billion other things, set that budget. Money talk can be uncomfortable and it can be tedious, but it is a hell of a lot less uncomfortable and tedious than what will happen if you run around like a drunken sailor on shore leave buying everything that’s not nailed down. Whether you are paying for it solo or getting help from the parentals, everyone should be clear on what’s being contributed. This is not to say unforeseen overages won't occur (a subject for another post), but you do need to work out a reasonable number (again, another post) and make it your best friend. 4. Decide on a style. A grand affair with a guest list 0f 300? An intimate soiree with close friends and family? Something in-between? Only you two can answer that. More importantly, only you two should be answering that (or, you two and your friendly neighborhood wedding designer, of course). The style of your wedding really shouldn’t be up for public debate. Remember, the best weddings are not necessarily the big, flashy ones. The best weddings let guests get a peek into the awesome couple and their awesome lurve. Above all, have fun! Slow down, be gracious and enjoy the ride. Everything will fall into place. I promise. I keep meaning to write a new post for each year, but honestly, the truth don't age, honey. Goldiluxe Events and Consulting is an emerging event design and consultation firm serving the Milwaukee metro area. 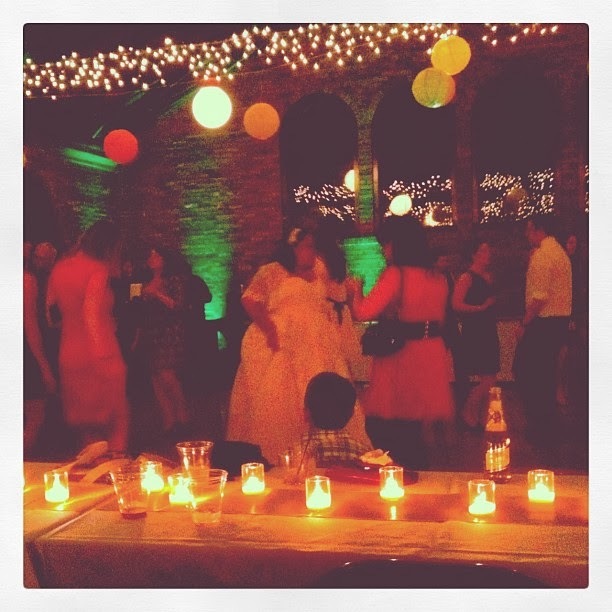 We specialize in creating dynamically stylish events with an emphasis on handmade, vintage and retro elements. In addition to design, we offer planning services for a wide range of celebrations including weddings, baby showers and birthday parties. In fall of 2013, we will be launching a line of party kits and supplies, called Goldi on the Go. Life is a glittering playground of possibility. Goldiluxe is a reflection of the beautifully luxe life I intend to lead. Goldiluxe exists to bring a piece of that spectacular beauty to you. I love making a splash! I always have! I have two naughty cats, a husband I adore and a lovely little home in Milwaukee's beautiful Bay View neighborhood. I spend a great deal of time lost in entertaining books penned by fabulous women in bygone eras. Getting in touch with the past helps me blaze my own path to the future!